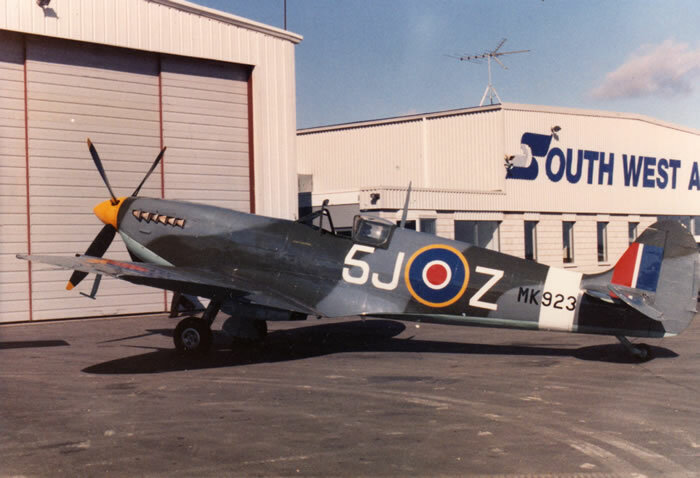 I have been very fortunate to have been ground crew on a Vickers-Supermarine Spitfire Mk IXc, serial No. MK923 from June 1976 till she was sold in 1998. 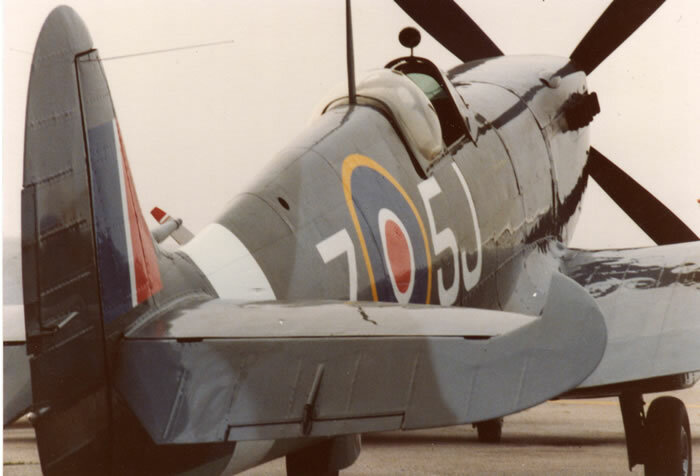 She was owned by the movie actor Cliff Robertson and piloted by wartime Spitfire pilot Jerry Billing during this time. 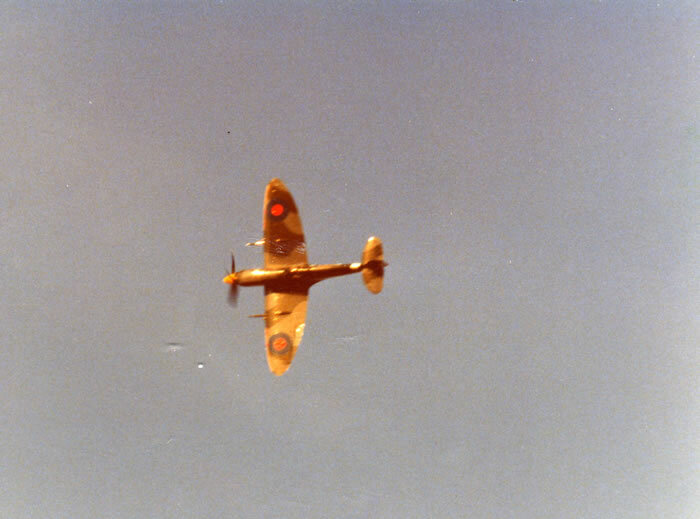 She had seen action in World War II with 126 Squadron RAF and had been marked 5J-Z while with that squadron. 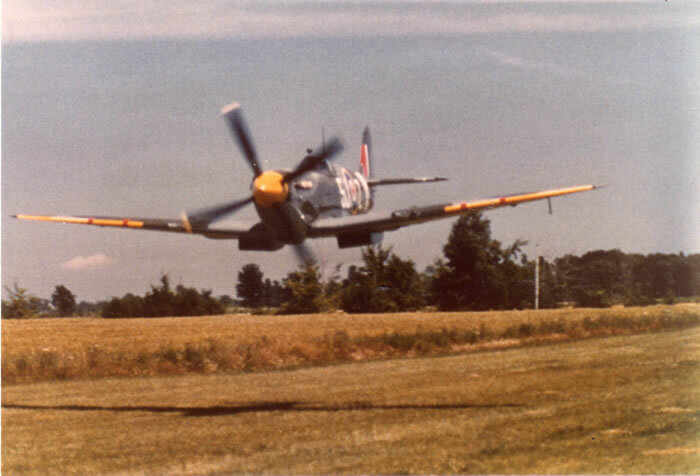 She flew on D-Day and had knocked down two Bf 109’s south of Paris on August 14th, 1944. 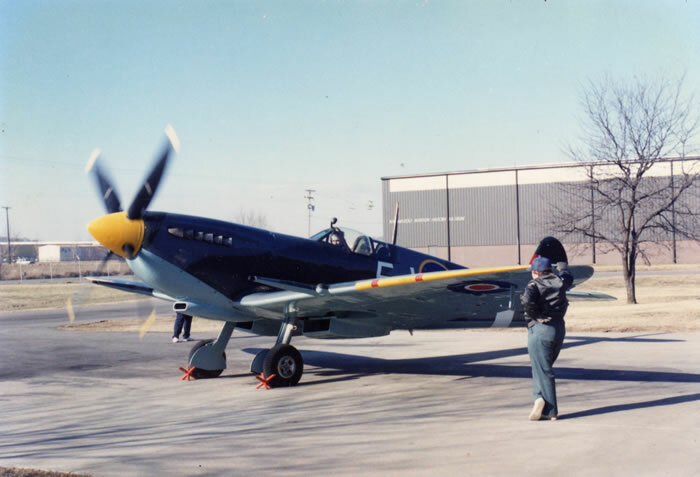 Over the twenty-two years that I spent with this aircraft I got to know her very well. I have an extensive collection of photos of her and many memories. Cliff sold her in 1998 and she sits grounded today at the Museum of Flight in Seattle Washington pretty much exactly as she was when I serviced her. Being a scale modeler, I had built replicas of her in 1:48 scale but these never really captured the exact look and “feel” of 5J-Z. 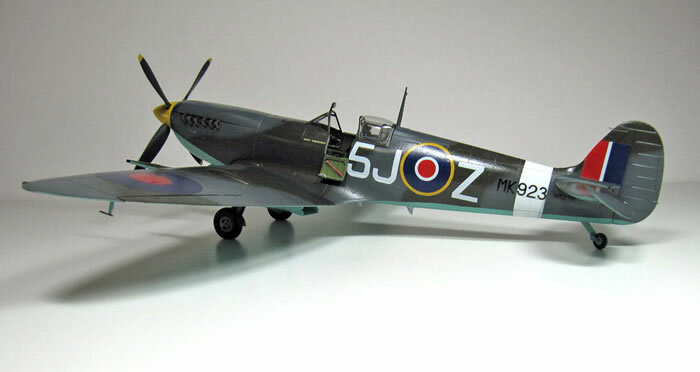 Then in the fall of 2009 Tamiya released a 1:32 scale model of a Spitfire Mk IXc that was superior to any Spitfire model (or any other plastic model in my opinion) produced before in any scale. Much has been written about this kit in reviews already and there is a book about it available. 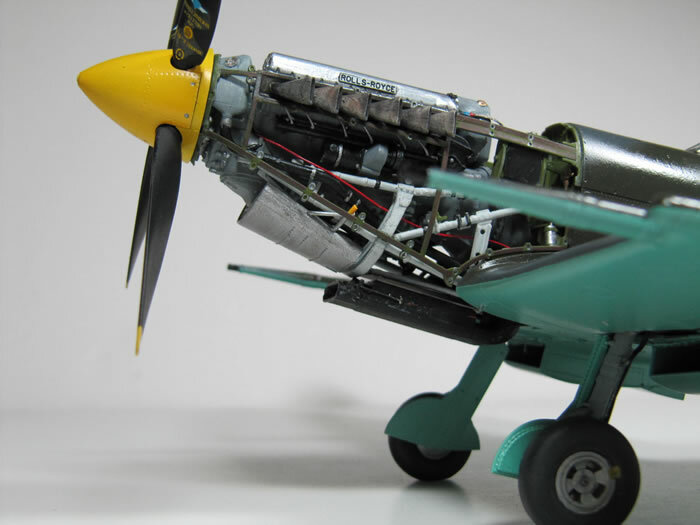 It features a highly detailed cockpit and Rolls-Royce Merlin 60 series engine and scale thickness removable cowls. 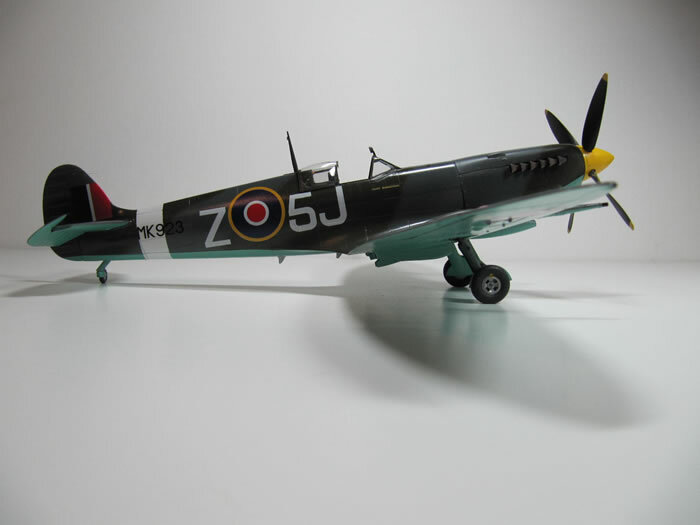 I obtained one and built it as Johnnie Johnson’s EN398 using the kit decals. My son said that it was time to build 5J-Z using the Tamiya kit and make all the modifications so that the finished model would be an exact replica of 5J-Z as we knew her. I knew that he was right but it wouldn’t be that easy. I started digging through all my old photos and sorting the useable ones out. There are never enough but I had what I needed for details and colour. I started work in the cockpit area. 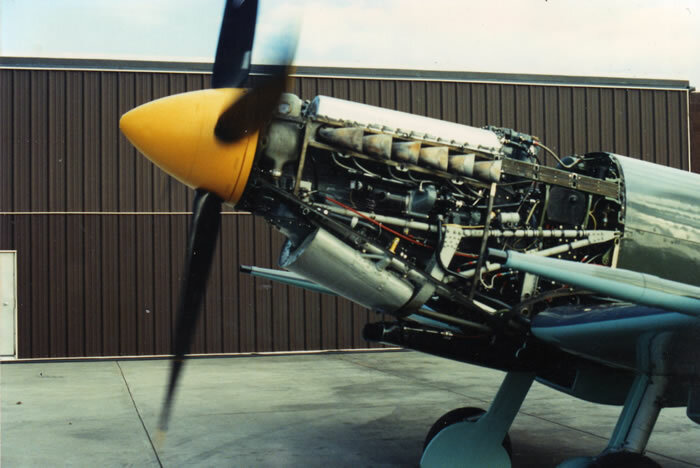 5J-Z was restored by “Dip” Davis in California in the mid 60’s. At that time there was no regard for authentic colours so the basic interior colour is zinc chromate green an exact match is Testors No.1715 Interior Green. 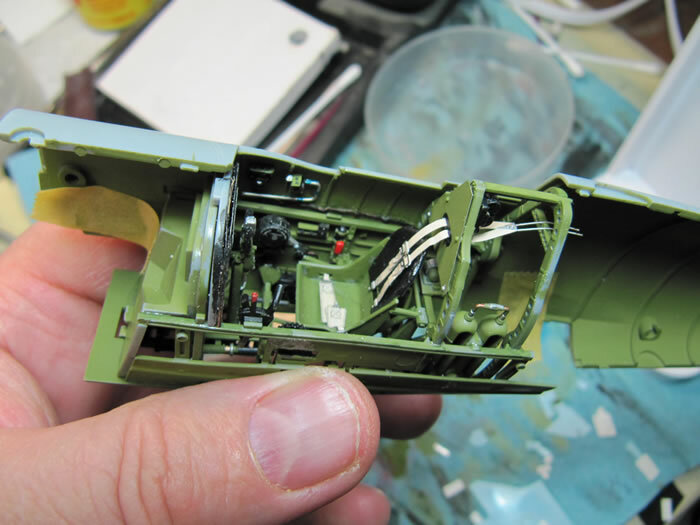 I airbrushed the major interior parts and started the project. Tamiya’s control stick is pretty anemic looking where PCM gives you a very nice cast resin stick. I used the PCM part and filed away the lower cine-camera button on the spade grip as this had been removed in 5J-Z. I also had to file the base to make it fit in the Tamiya part and cut an opening to mount the Tamiya push rod. The drop tank fuel selector and cable release are still in 5J-Z but are painted black with red handles. 5J-Z actually had a slipper tank that could be used but Jerry never trusted it and it was later sold. 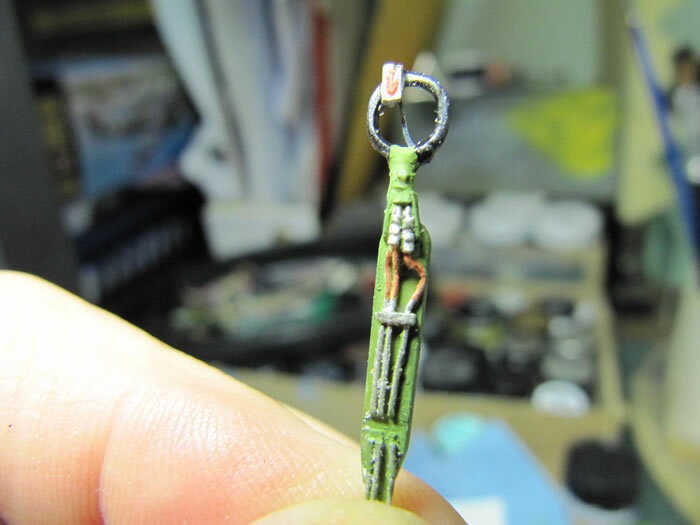 Tamiya gives you this part as a photo-etch and it is very well done. The seat was assembled next leaving off the flare cartridge holder (part No. 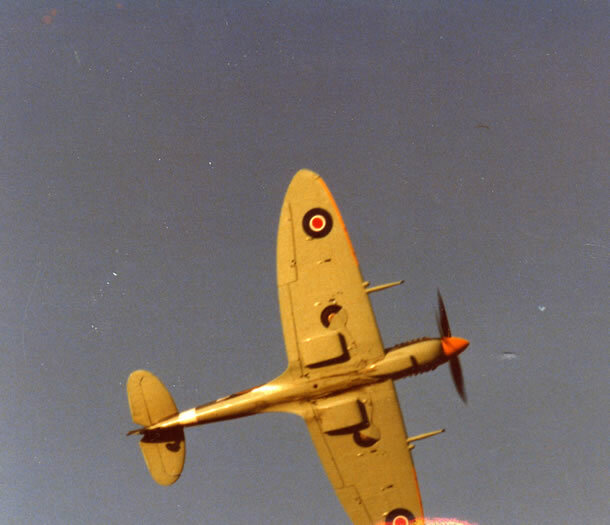 F48…this only appearing in early Spitfires). The seat in 5J-Z is painted Interior Green. I made a leather seat back pad out of tape and painted it black. I left off the seat armour plate as this was removed from 5J-Z. The harness that Tamiya gives you is the earlier Sutton harness with pin and clips. 5J-Z was fitted with the later “Q” harness and this is supplied in the PCM kit. 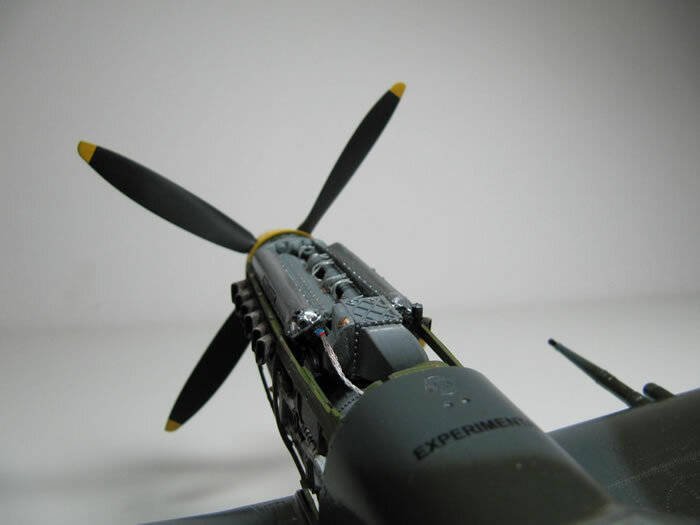 I used it adding the two adjustment cables that disappear into the rear fuselage. 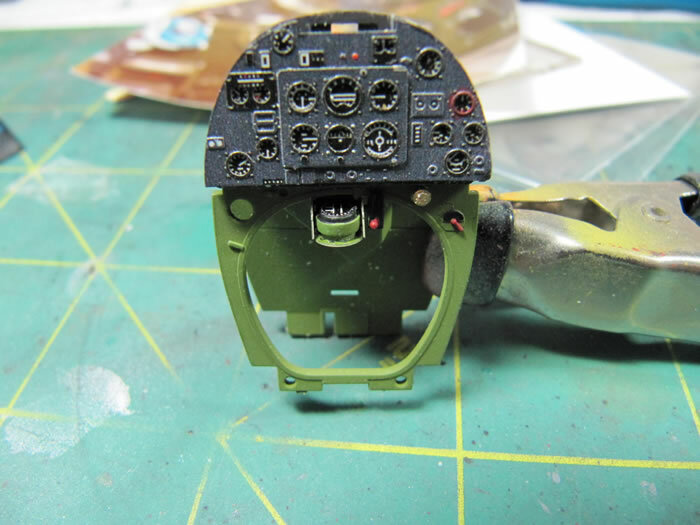 I left off the radio selector box (part F13) and removed the mounting block from the port fuselage side. I have the original wartime one removed from 5J-Z in my collection. On the starboard fuselage half I used part F30 after I removed the three spare reflector sight bulbs and drilled out the holes for them. I fabricated a wobble pump mounted just aft of the spare bulb holder and ran wire to represent the piping to the pump. The compressed air bottles on the port sidewall are painted Interior Green. 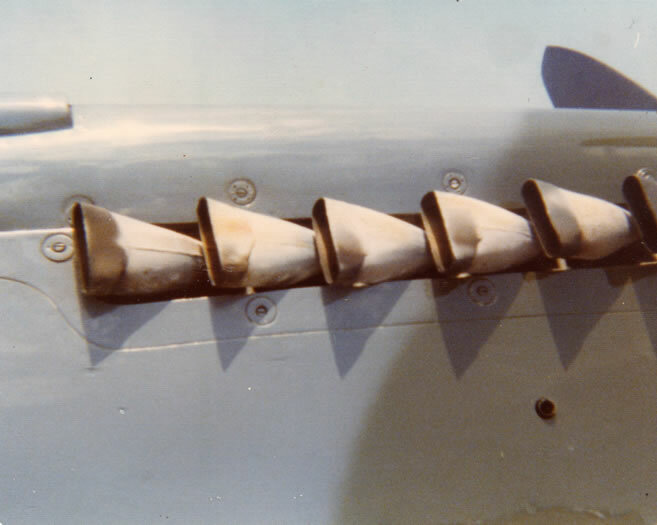 The undercarriage selector on the starboard sidewall was modified by drilling out holes for mounting hydraulic piping made from small wire and using the PCM placards. 5J-Z had her oxygen system removed so I trimmed off the mount and left the oxygen bottle out. 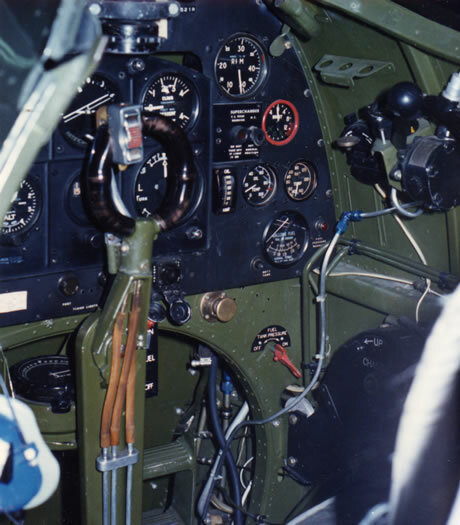 The gunsight in 5J-Z was mounted too low and very tight to the instrument panel. 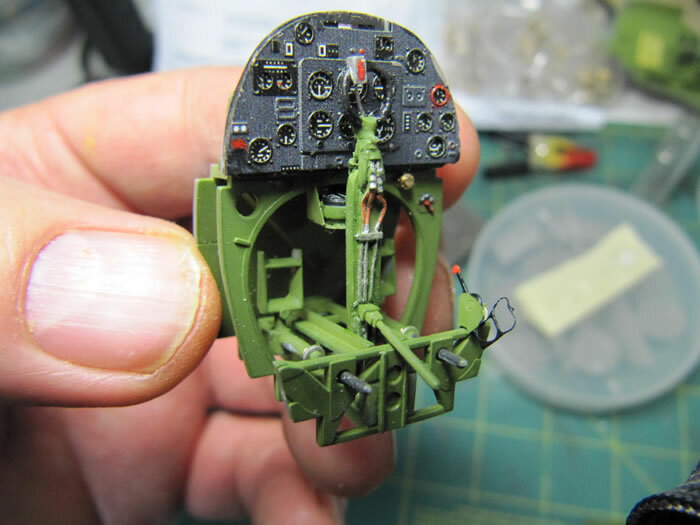 I used the Tamiya reflector sight but modified it extensively to be too low and tight to the instrument panel. After test fitting everything came together perfectly inside the fuselage halves which were glued together following the kit instructions. I left the tailwheel assembly off till later. 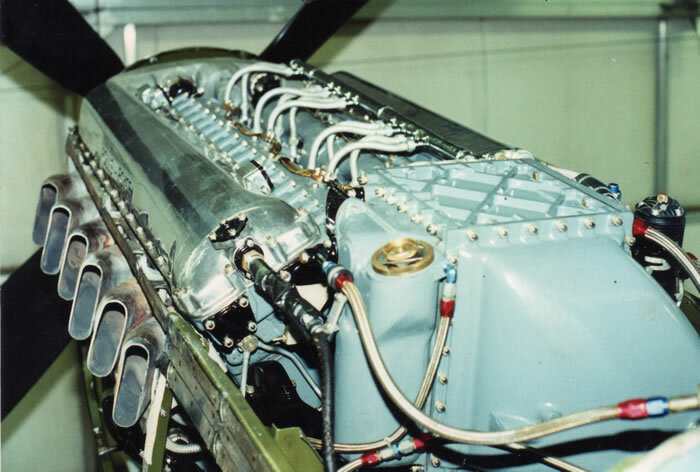 5J-Z has a Rolls-Royce Merlin 76 engine fitted, which is exactly the same as a Merlin 66. 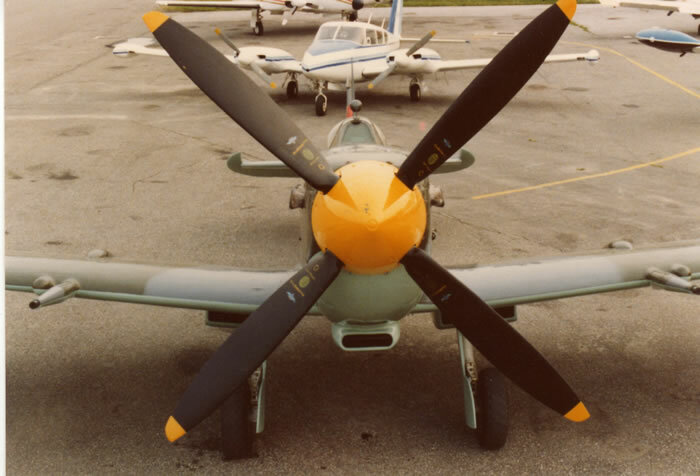 According to the engine log book it was originally the starboard engine in a late production Mosquito. Wartime Merlins were painted black but this one was rebuilt and painted a dark grey to make it easier to find the source of oil leaks. I used Testor's No. 2121 Russian Underside Gray. All the accessories fitted to the engine were black. The intercooler header tank is integral with the intercooler and is mounted on the port side of it. I scratch built this from styrene and Tamiya Epoxy Putty then filing and sanding it to shape. I added the filler cap using styrene tubing. Later I added piping from the header tank to the firewall using solder-wick painted Testors Steel to give the piping a braided look. I scratch built the ignition tubes and wires from styrene and fine wire. Tamiya gives you the location for the spark plug wires on the cylinder blocks leaving the modeler to drill them out, all 24 of them. 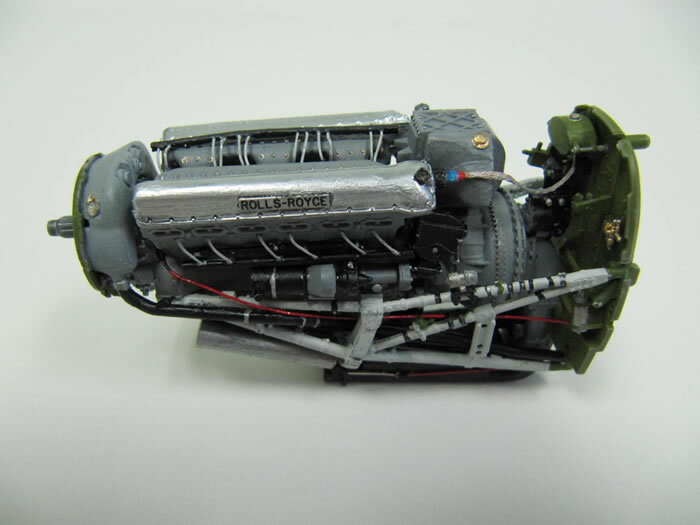 The Tamiya rocker covers are plain as on Packard built Merlins. I obtained photo etched “Rolls-Royce” emblems from Tony Bell and painted the covers Testors Chrome Silver to replicate the polished rocker covers on 5J-Z. The firewall is painted Interior Green. The engine bearers are painted a very light grey. I used Testor’s No. 1732 Light Gray. The coolant and oil piping on 5J-Z is painted black. I modified the glycol tank by adding a filler cap to the port side. The oil tank was modified by adding a filler neck. The oil and glycol tanks were painted Testors No. 2058 RAF Medium Sea Grey. The cowling frames are Interior Green and I painted brown to represent the anti-chaffing tape. The exhaust stacks are the ejector type and are painted a light tan colour then weathered with pastel chalks. 5J-Z has the updated undercarriage that uses the torque link scissors, and the corresponding oleo fairings with the modified wheel well openings and the four slot main wheels. 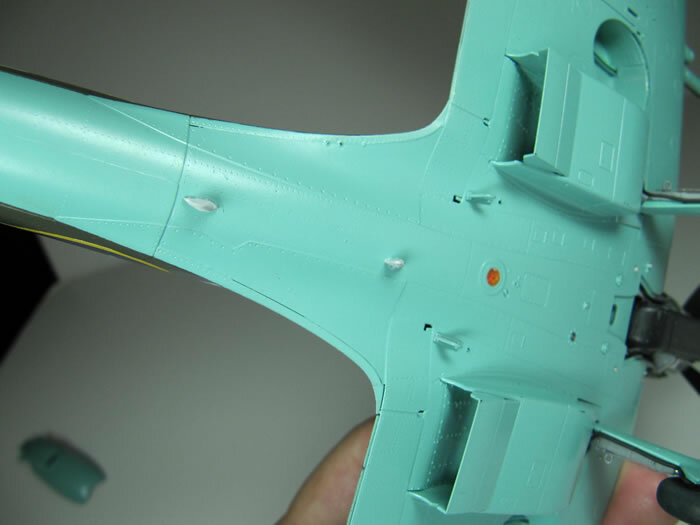 The actual wheel wells and oleo fairings are the underside colour, but the portion of the wheel wells for the oleo legs (parts G17 & 18) are Interior Green. The oleo legs themselves are Light Grey. I used Testors No. 2037 Flint Gray. I drilled out the “up-locks” on the oleo legs and added fine wire to represent the safety cables. I used the Tamiya kit wheels painted Aluminum and the backs are Aluminum and Steel for the brake hub. I am not a fan of rubber tires but sanded them to look dull. I hand painted the creep marks with yellow paint. 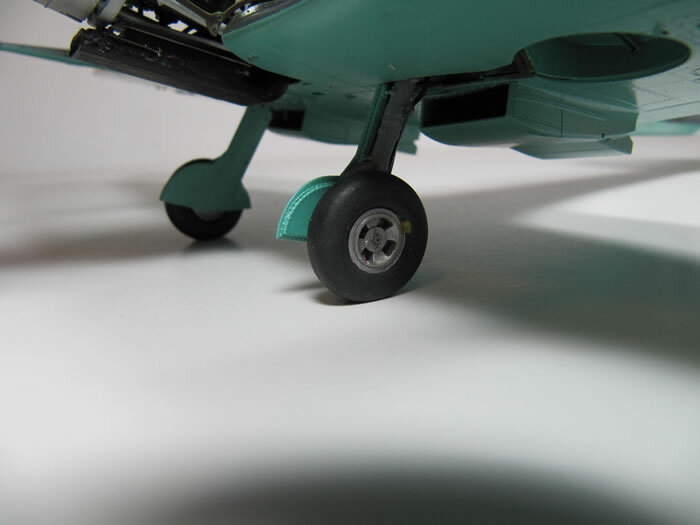 I used white glue to mount the wheels to the oleo legs so that I could replace them later with cast resin wheels that I could file flat spots on the bottom to give the impression of weight and properly inflated (56psi) tires. BarracudaCast later came to my rescue with resin wheels and I did change them. 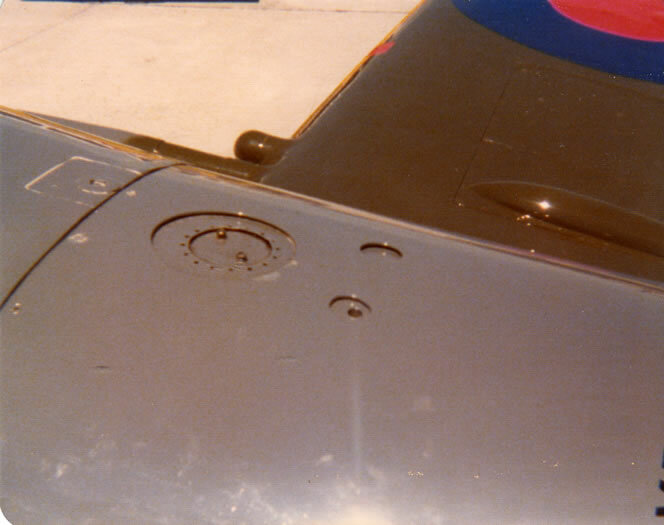 The tailwheel on a Spitfire is non-locking. Very often it is not straight when sitting. 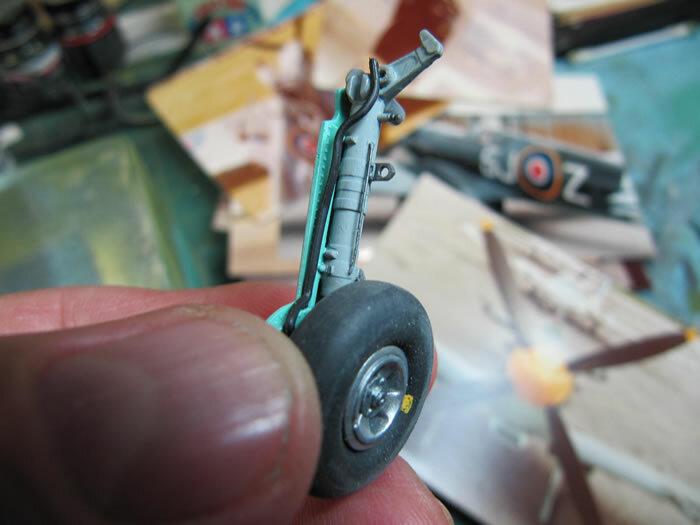 I built up the Tamiya tailwheel. 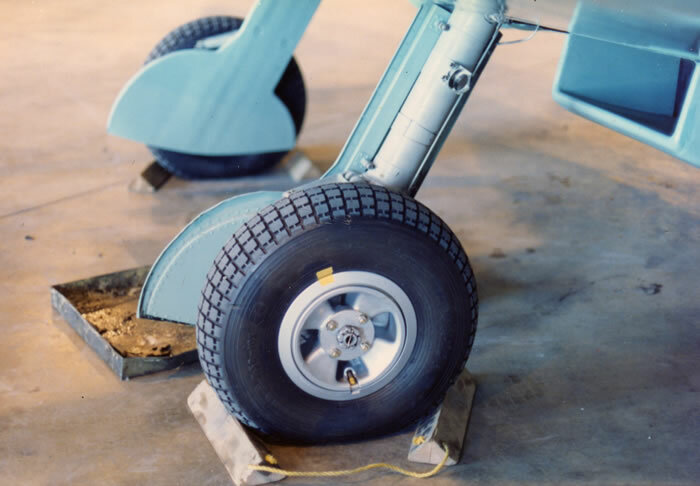 The strut and fork are underside colour and the wheel is Aluminum. After it was assembled I cut the castoring part off and drilled small holes to take small brass wire at the center pivot point. I glued one end of the wire in the fork for the wheel and then pressed the other end in the strut. This makes the tailwheel posable. The rest of the kit is built as per Tamiya’s instructions for the late Mk IX (option C) with the following exceptions. 5J-Z uses the regular (rounded) rudder and the full wingtips. Tamiya gives you the slipper tank hooks and mounts but neglects to mention them. 5J-Z had them so in step 21 you need to drill out the two rear mounting holes for the larger slipper tank hooks, part No.J2. The mounts for the tank are parts No. J9. I drilled out the two 1inch holes in the fuel tank cover plate but not entirely through. 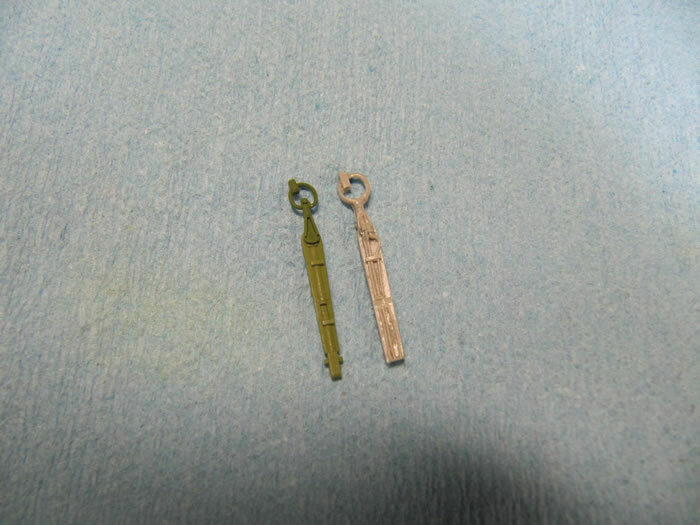 Tamiya has included these but they are very faint. I drilled a small ½ inch hole through the plastic in the port cover plate hole to represent the fuel vent. 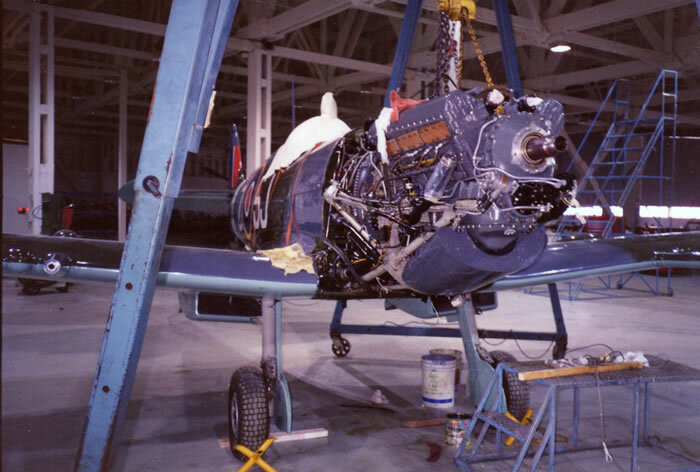 The machine gun blast tubes are filled and smoothed as on 5J-Z. I used the later balloon upper cowl but filled the intercooler coolant hatch with putty and scribed a new one forward over the new intercooler header tank. I drilled a small hole in the starboard side cowl and added a small stub of styrene rod poking through to represent the coolant pop-off vent. This was painted Copper. A No. 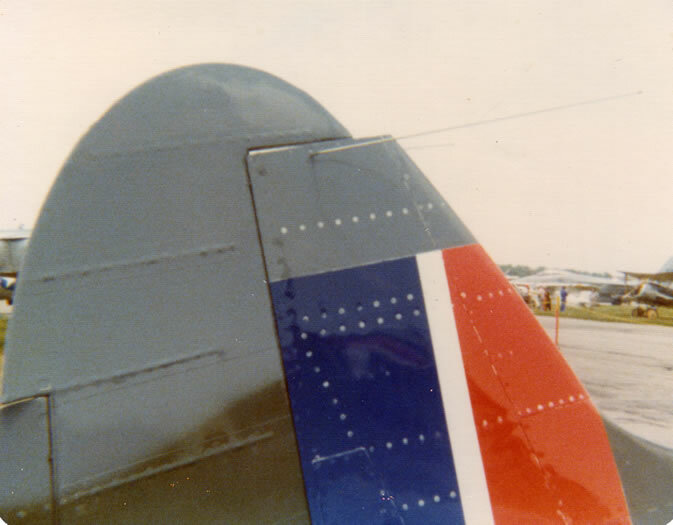 80 hole was drilled straight through the top of the vertical stabilizer and a fine brass wire passed through and bent to represent the modern aerial. It was painted Steel. I used two different sizes of airfoil shaped styrene and filed these to shape to represent the two blade antennas on the belly. Note that they are not on the centerline; both are on the port side to miss the center longeron. I drilled out the flare chute hole on the rear starboard fuselage. 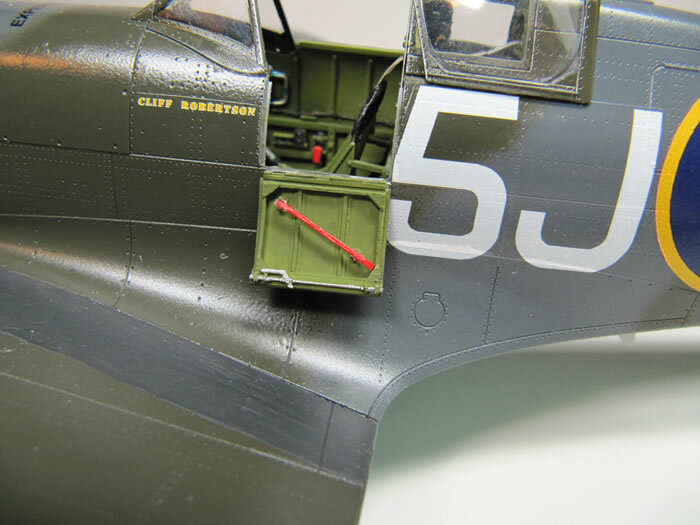 I used the kit supplied cockpit door which is OK but the latch and crowbar are not defined enough. I glued it on after the model was finished using white glue so that it could be removed easily if someone came out with an aftermarket door. BarracudaCast came to the rescue with an excellent door with a separate crowbar. I pulled the kit part off and replaced it with the BarracudaCast door. 5J-Z is painted incorrectly. 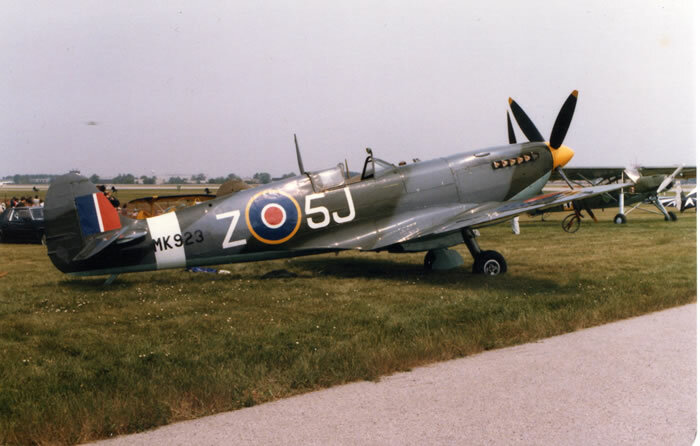 The colours are wrong and the camouflage pattern is wrong when compared to a standard World War II RAF Spitfire. 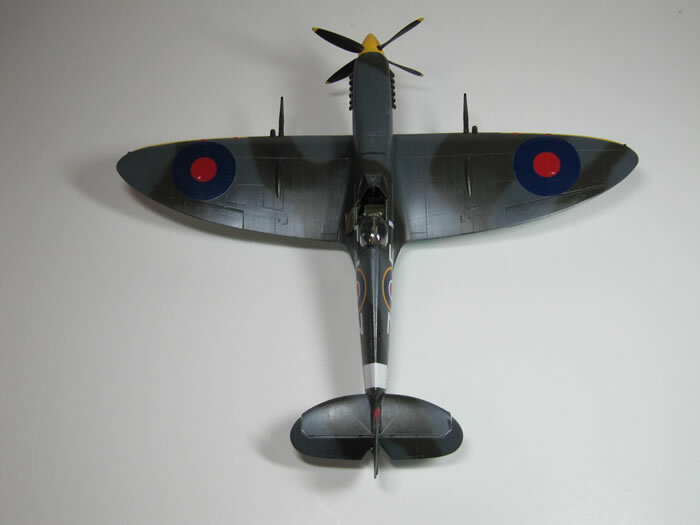 But this is a model of 5J-Z and this is where the wrong colours and camouflage pattern are right because I am depicting the real aircraft. I studied photos of 5J-Z trying to get the exact colours from the prints. The trouble is, depending on the lighting conditions, the photos can only get you close. I phoned Erik Billing, Jerry Billing’s son, and he found cans of the original touch-up paint and made up sample cards. Now I had something positive to go by. The hardest colour to duplicate was the underside colour. 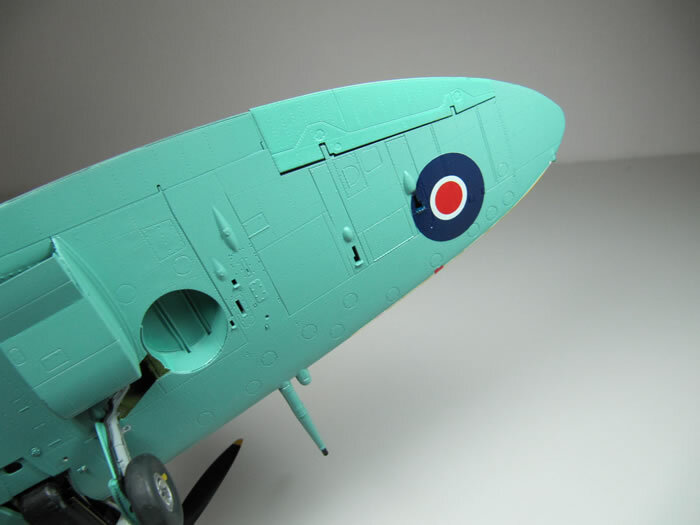 Someone back in 1976 thought that Spitfires were painted “Duck-Egg Green” underneath so they came up with a colour totally wrong. I couldn’t find anything that I could use straight out of the jar but discovered that Testors No. 2135 Russian Interior Blue/Green was a good place to start and I added white till it matched the paint sample. I had my doubts though about the colour being right but when I sprayed the entire belly of the model it looked like “home”. The way the light hit it was just right and I felt like I should crawl underneath and start wiping her down. The upper surface green is actually pretty close to RAF Dark Green but is a little too brown. I found Testors No. 1787 Green Drab to be an exact match right out of the jar. 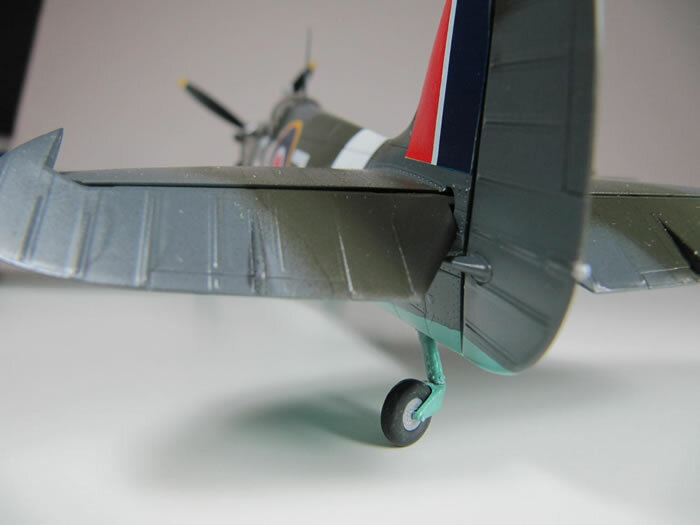 The upper surface grey is a little darker than RAF Ocean Grey and Testors No. 2101 Anthracitgrau is another exact match. I followed the camouflage pattern from the photos. I used Testors 2717 Bright Yellow for the spinner and the wing leading edges. The red tape over the gun ports was an afterthought on 5J-Z and was actually two strips of red duct tape. There was a tiny strip of yellow showing between two strips. I used 2 inch red decal striping and left a little yellow showing through as on 5J-Z. I sent photos of 5J-Z’s markings to Bill Burns at CanMilAir Decals and he duplicated them for me and offers them as a set in his excellent range of decals. The markings are in the standard locations until you get to the underside roundels. During all those years I hadn’t noticed that the roundels are placed forward and a little outboard of where they should be. 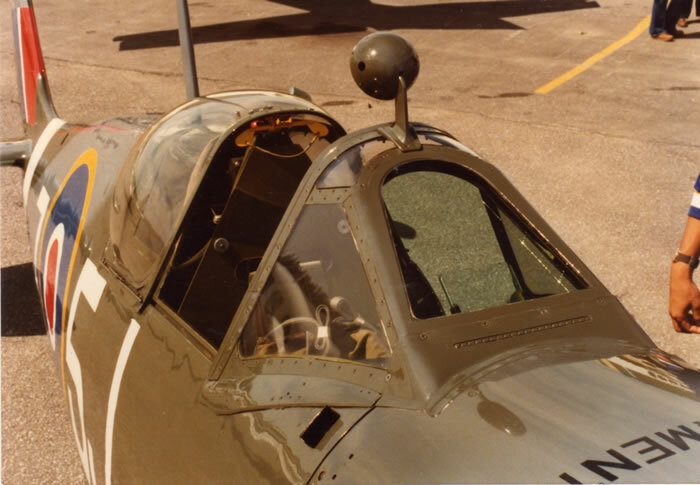 5J-Z carries no wing-walk lines or stenciling other than “EXPERIMENTAL” across the fuel tank, Cliff’s name in yellow below the windscreen and her registration, N521R, below the horizontal stabilizer. The walkway was painted by hand using Floquil Grimy Black. The walkway on 5J-Z was hand painted also and it seemed that we were always touching it up. The walkway material was very messy and was a very dark grey. 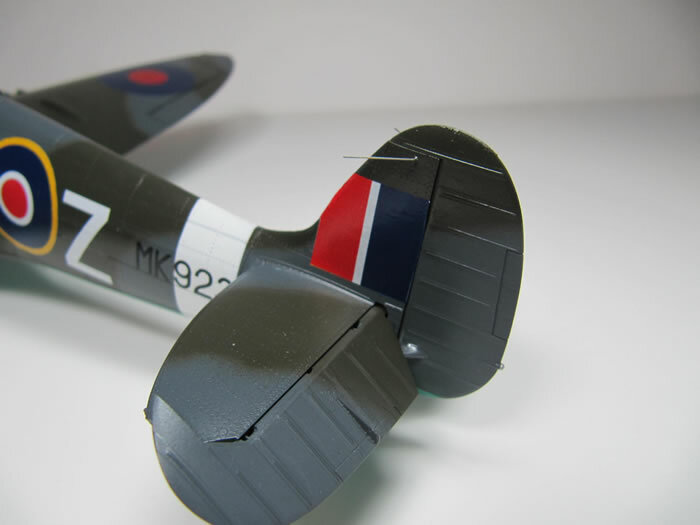 I used BarracudaCals decal sheet BC32004 Spitfire Mk IX Series Part 1 for the postwar Dowty-Rotol propeller decals. These really make a difference in the final appearance. 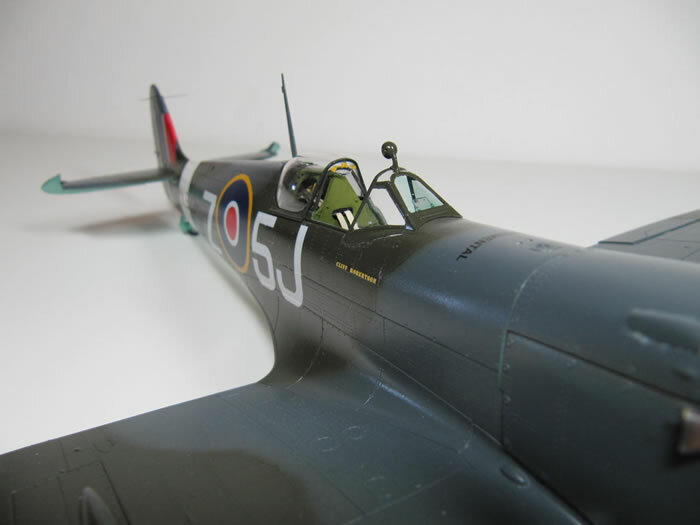 Thanks BarracudaCals for going that extra mile for us Spitfire modelers. The Tamiya canopy masks were carefully cut out and positioned very carefully. 5J-Z has black canopy frames inside. 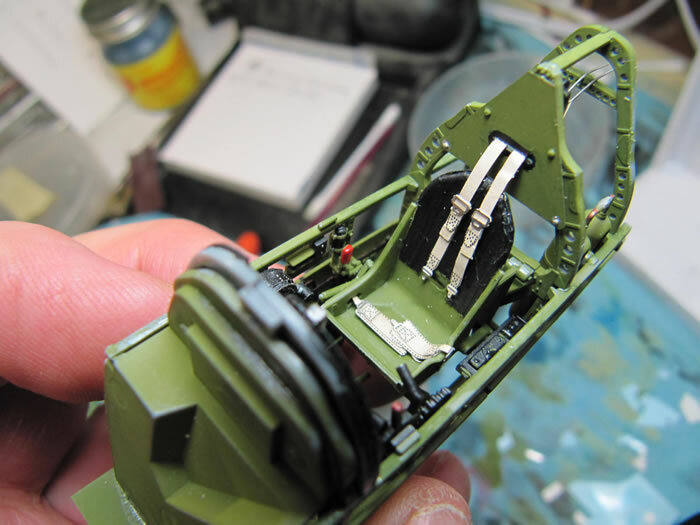 After painting the canopy and removing the masks I tinted the armoured windscreen by adding a drop of Testors No. 4668 Acryl Clear Green and No. 4658 Clear Blue to a bit of Future Floor Wax then brushing it on the inside of the windscreen. It came out perfect. When viewing the completed model of 5J-Z I drift back into time a little bit. She looks great both with the cowls off and with them in place. They really do fit that well if you are careful with the engine assembly. The only obvious concession made on the model was that the tires do not have a tread pattern but I am hoping. I have heard that BarracudaCast has plans for them. 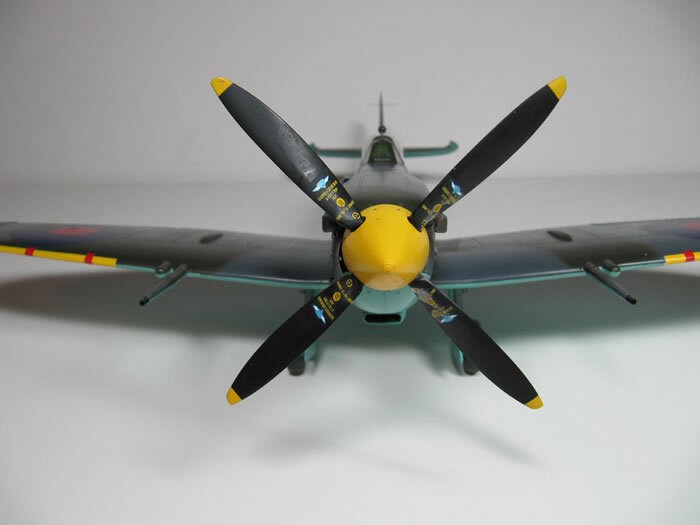 Tamiya really did an outstanding job with this model although there are some minor improvements that can be made. It took four months to finish this model and I enjoyed every minute of it. The one thing that is missing though is the smell of the cockpit and I don’t think anyone can duplicate that or the aroma of the exhaust when she fires up. Like an old girlfriend, I still miss her.